Marketers familiar with pipeline marketing are 48% more likely to see ROI greater than 1.5x. Marketers who identify as pipeline marketers are 119% more likely to report sales and marketing alignment. 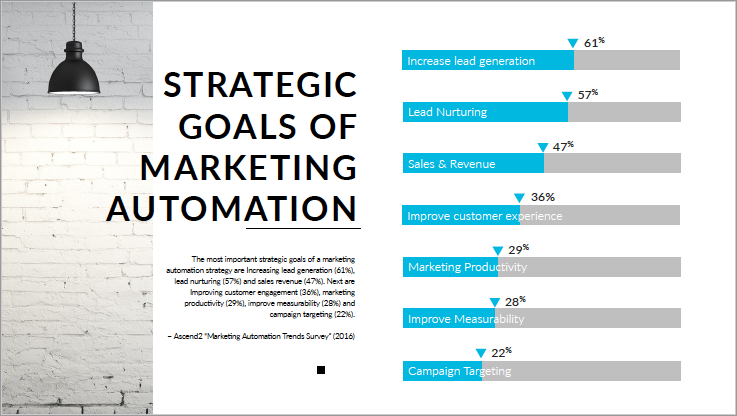 A synopsis to why your company should invest in marketing automation. It can be an easy start to generate more leads, convert leads to sales opportunities and prove your marketing returns. Many of us marketers and executives are familiar with ‘unfound’ reasons not to invest in marketing. In this PDF we’ll bring your attention to a few benefits as to why you should. Use the form to the right to download our PDF.